In the afternoon we’ll deliver a tour briefing and finalise formalities. Here you’ll find out more about the route you’ll be travelling, have the chance to meet others on the tour. We’ve planned a tour of one of the world’s most beautiful cities for early evening. We’ll be pulling out all stops on your first night and be taking you out to a local restaurant certain to tantalise your taste buds. 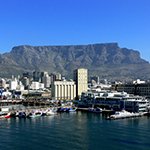 We’ll be arriving back at the hotel late afternoon, and take you out for a dinner to one of Cape Town’s trendy restaurants. In the afternoon we’ll continue our ride up the Michel’s Pass to Ceres, and on to Touwsrivier. We now get the first opportunity to ride on gravel roads (unpaved roads). Alternatively we can take the tarred road via the beautiful Koo Valley. Late afternoon we’ll arrive in Montagu, to spend the evening in a lovely Guesthouse. Taking it easy. 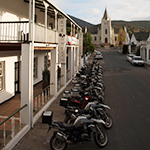 We’ll be leaving again at 9am after breakfast and be travelling via Bonnievale to Swellendam. 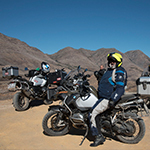 From there, we’ll travel over the Tradouws Pass to Barrydale where we’ll once again be travelling on the Route 62, a quick stop for lunch, and then off to Ladismith, and over the Huisriver Pass to Calitzdorp. We turn left, to leave the R62 and continue on gravel roads through Kruisriver and Matjesrivier to the Swartberg Pass. 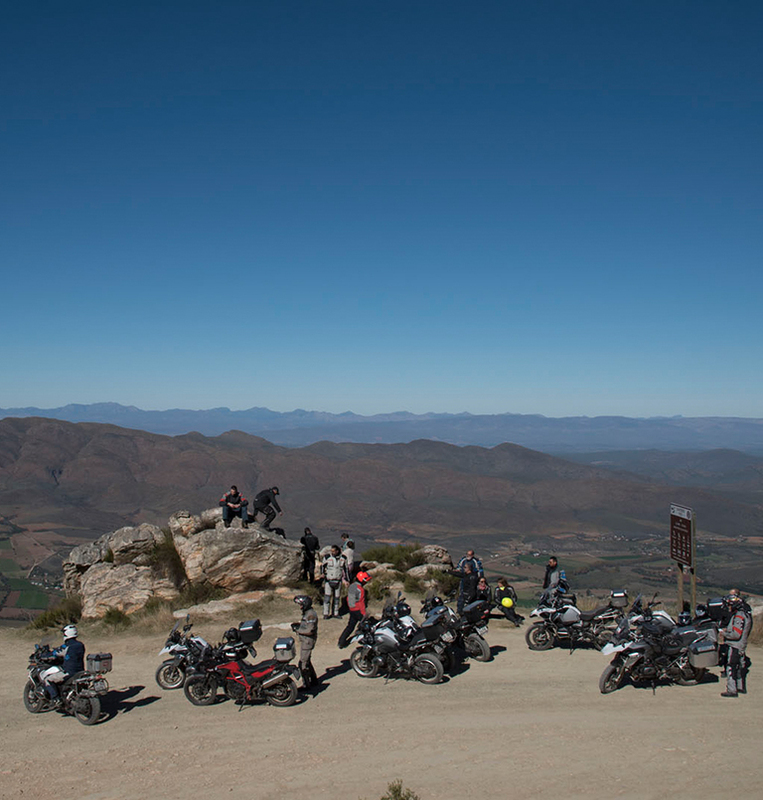 At the pass’ summit (at around 1568m) we’ll be taking a good break, to enjoy the views. From here it is just a short ride to get to Prince Albert, our destination for the night. We’ll be staying at the Swartberg Hotel. 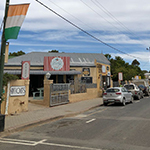 You can opt for a guided historical / architectural walk through the town that takes you past beautifully preserved Cape Dutch, Karoo and Victorian buildings. Of these, 19, including Dennehof, are National Monuments. Other activities include a ‘koppie’ trail with almost 100 listed plants, fossil hunting and a visit to the delightful Fransie Pienaar Museum. The town is known for its sun-ripened fresh and dried fruit, especially figs and apricots. Karoo lamb, olives, olive oil and homemade cheeses are local delicacies. Needless to say, dinner will be a culinary delight! It’s hell. Today is certain to be one of the tour’s highlights. After breakfast we’ll head back up to the Swartberg Pass at around 10am. We’ll be taking a right and be heading off down Gamkaskloof to a place better known as the Hell. This is one of the most isolated areas in South Africa. This is also the place, where your off-road riding skills come in handy, for some of the road to “De Hell” you need to be standing on your pegs, so please make sure that your thighs muscles are in good order. Should you not feel confident riding on this road, you can always opt to go down to “De Hell” in our support vehicle, this is certainly recommended for passengers travelling with you. After a good lunch, some rest in the valley, and possibly a swim in one of the rock pools, we’ll head back to Prince Albert, for another night at the Swartberg Hotel. Feathers and eggs. Today we’ll be travelling to South Africa’s ostrich farming capital, Oudtshoorn. This will be a sightseeing day. 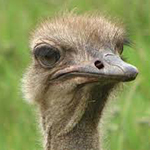 We recommend taking in a visit to an ostrich farm and if you’re under 80 kg’s, interested parties could even trade in their motorcycles and try their hand at riding a feathered friend. You are also able to visit the Cango Caves as an added option. These are ancient underground caves with breathtaking rock formations called stalagmites and stalactites. We’ll be staying in hospitable Oudtshoorn for the evening. 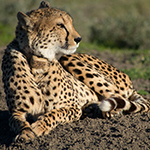 We can arrange for interested parties to visit a crocodile or even cheetah farm! Simply ask! Pearl in the oyster. 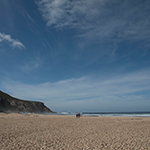 Today we’ll be heading off to the coastal town of Knysna, well known for its seafood and especially for its oysters. We’ll be lunching at the Knysna Waterfront, taking in the views of the Lagoon. Although currently not in service due to repairs, interested parties can take a ride in the Outeniqua Choo-Tjoe, a steam train running between George and Knysna. 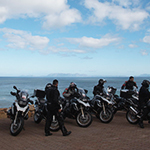 In the afternoon, we’ll be travelling back to Oudtshoorn, riding along the coast past Sedgefield and Wilderness. Once again, we stay at the same guesthouse in Oudtshoorn, but take you out for a dinner to town. Coming over the Outeniqua Mountains for the 2nd time, we’ll be passing through George and Knysna and then hit the Knysna Forest. You can expect to see Outeniqua yellowwood trees draped with Old Man’s Beard lichen – an imposing and impressive sight. We’ll be taking a look at a particularly big, old specimen at Diepwalle forest station: the ‘King Edward VII’ tree. It was so named in 1924 on a visit by the Empire Parliamentary Association. The tree is an estimated 600 years old, is 39m high and the bole’s circumference is 6m. 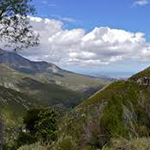 Thereafter, we’ll be passing through Nature’s Valley and the Bloukrans Pass. From Kareedouw we’ll go down past the Langkloof Mountains. We’ll lunch in a typical farm stall, before heading off to a charming hotel near the Addo Elephant Park. There be elephants. We’ll be leaving early this morning to get to the Addo Elephant Park. Motorcycles will be left at the hotel as the park will be discovered by four-wheel drives. 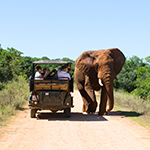 The park is home to more than 350 elephants, leopards, rhinoceros and Cape Buffaloes. The park also boasts a myriad other wildlife and at least 400 different bird varieties. Your afternoon free time can be spent on an optional elephant back safari, a short motorbike ride to this missionary town of Enon or of course relaxing at the hotel. We spend the evening at the hotel. We’ll be leaving Addo Park today and making our way back into the Karoo to visit Graaff-Reinet – one of South Africa’s oldest towns. It was founded in 1786 and named in honour of Bouverneur Cornelis Jacob van der Graaf and his wife, Cornelia Reinet. Before we reach the town, we’ll be breaking to spend the night in a Private Game Reserve, approximately 60km from Graaff Reinet. 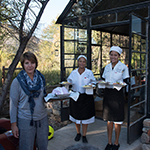 After a delicious high tea, we’ll take a safari through the property to see giraffes, antelope, rhinos and cheetah. The customary sundowners will be taken on a hilltop with glorious views. We spend the evening in the Game Reserve’s luxurious lodge. This is the first day of our return journey to Cape Town. From the Game Reserve we head out to Graaff-Reinet – often referred to as the Jewel of the Karoo. The town centre, comprising 200 buildings, was lovingly restored as is now considered a national monument. We’ll be revving our engines once again and this time, along the N9, discovering forgotten cities like Aberdeen and Willowmore. 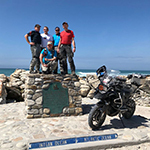 Once we get past Willowmore, our road will be more interesting again, passing Uniondale and Avontuur, we are riding via the Prince Alfed’s Pass to the Indian Ocean. Our destination today is Knysna, where we’ll enjoy an evening meal together. Today we’re not going anywhere, because today is a day of rest and pure relaxation. Knysna is set on a Lagoon, whilst being bordered by the Outeniqua Mountains. Renowned for it tranquil sea and beautiful Lagoon, Knysna has become an internationally sought after holiday resort. 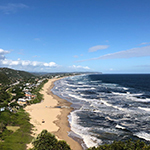 Knysna is also surrounded by many rivers and natural lakes and lagoons. This makes it a great spot for water sport enthusiasts. You can opt for hiking, dolphin and whale-watching, hang-gliding, paragliding, horse riding, mountain-biking, scenic drives, a boat trip on the Lagoon, day tours, ferry cruises, angling, boating and other water sports – simply ask and we will gladly provide further details. Our next destination is Mossel Bay. Shortly thereafter, we’ll leave the N2 and travel to Riversdale. Just before we get to Swellendam, we turn left to cross the Breede River at Malgas on a legendary ferry. From there, we’ll travel on minor roads to Arniston, which is our final destination for the day. Not far from the southern-most point of Africa, you can enjoy a lovely dinner at one of the towns fish restaurants. Arniston used to be a Fishermen’s village, many of the old fishermens cottages are still standing, some of them being utilised as self-catering units. We are staying at the Arniston Hotel for the night, right on the beach. This is our last day and we’ll be making our way back to Cape Town, but not before having seen Africa’s southern-most point, Cape Agullas. Thereafter, we’ll head onto one of the world’s most famous whale watching destinations, Hermanus. This is where you will return the motorcycles. We will then either transport you to the airport or to your hotel or guesthouse. Please remember to let us know whether you would like to stay an additional night/s in Cape Town and we will make the arrangements for you. This will need to be paid for by you.